An analysis of the practical implications of the changes made by the AIA section. The America Invents Act Primer additionally highlights a number of free resources that can be utilized by readers to attain a deeper understanding of the AIA, including resources that explain how the U.S. Patent and Trademark Office is applying the new law. Overall, the America Invents Act Primer provides a unique and practical desk reference on the AIA that is sure to be useful for years to come. 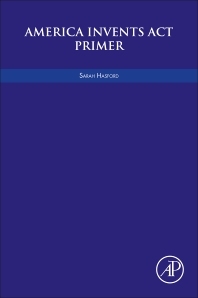 Sarah Hasford has been involved in the field of patent law for almost ten years. She began her career working as a Patent Examiner at the United States Patent and Trademark Office in Alexandria, Virginia where she examined patent applications directed to heterocyclic pharmaceutical and agricultural compounds. After working as an Examiner, Sarah attended law school at Franklin Pierce Law Center (now known as the University of New Hampshire School of Law). While in law school Sarah interned for the Honorable Arthur J. Gajarsa of the United States Court of Appeals for the Federal Circuit. Upon graduating from law school, Sarah entered private practice in the Washington, D.C. area. Sarah’s practice spanned all aspects of patent law, including patent prosecution, opinion work, and litigation with an emphasis on pharmaceutical patent litigation under the Hatch-Waxman Act. In 2015, Sarah left law firm practice to pursue her passion for educating non-legal professionals about patent law. This is a truly outstanding book that thoroughly covers every aspect of the America Invents Act. It is the only book on the market that covers all aspects of these fundamental changes to U.S. patent law, and I would highly recommend this book to any patent attorney, and to anyone involved in the protection of U.S. patent rights.